First few months I would run a five-kilometre pentagon route resembling the old Soviet quality mark. 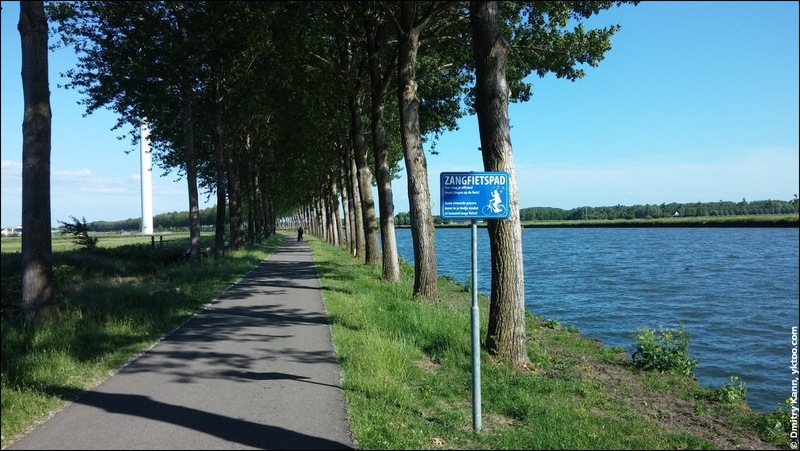 It follows a bike path that goes along an embankment, each side is almost exactly one kilometre. The only annoying thing was that it's 300 metres shorter than the required five kilometres, which I always had to "top up". March. 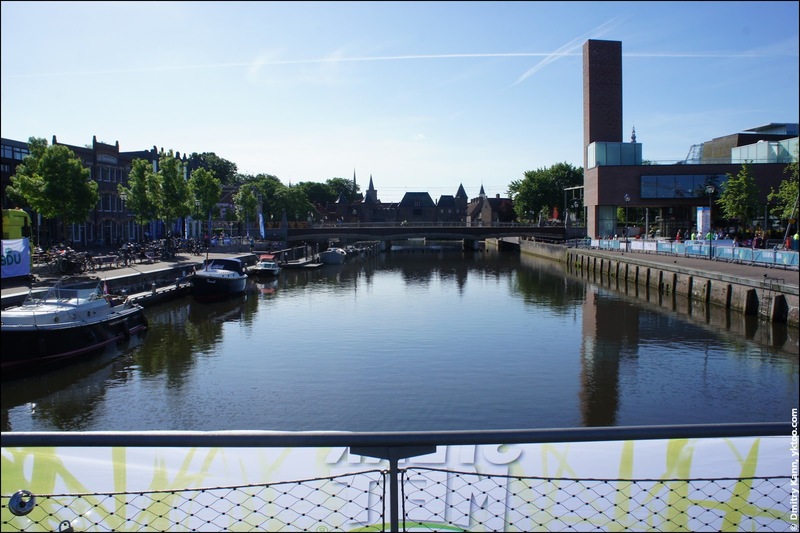 The Amsterdam-Rijnkanaal is on the right. Cyclists are officially allowed to sing here. No more awkward pauses in your song because someone is cycling by! The Amsterdam-Rijnkanaal and the Zangfietspad in June. 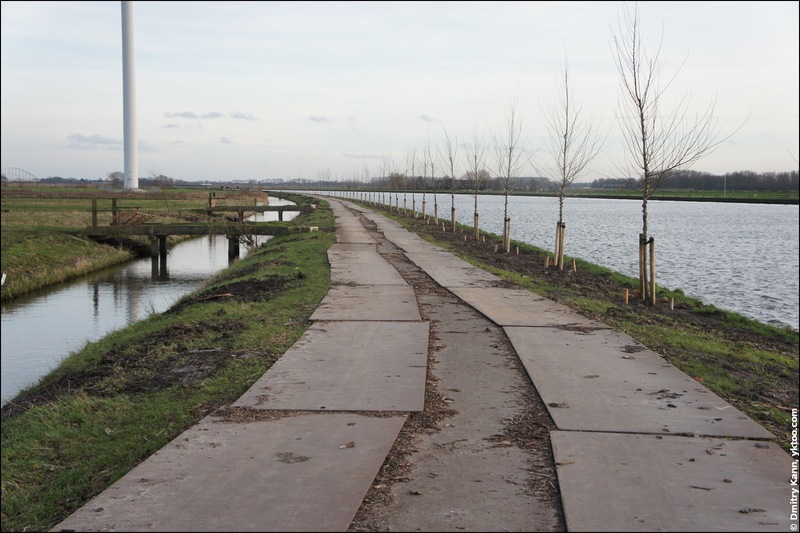 The Amsterdam-Rijnkanaal with young trees. Of course they should know what they're doing, but it's a pity the shady alley is gone. I'm also impressed by Dutch diligence, as they have laid out a two kilometre long stretch with metal sheets to protect the road from the trucks. 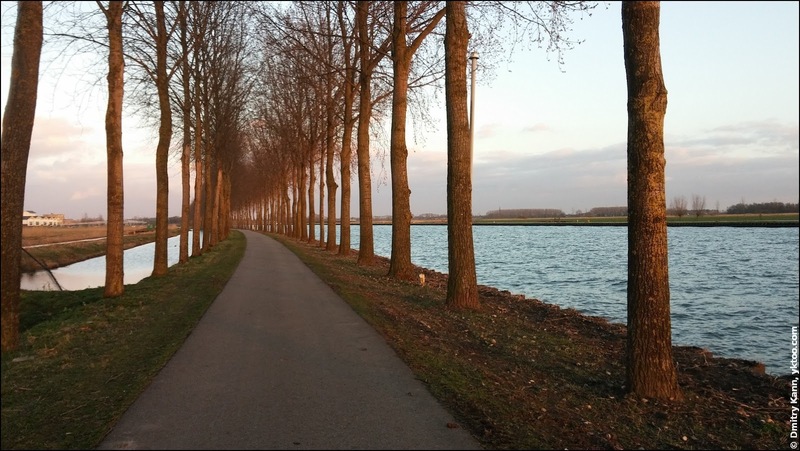 The works should be finished by March, let's see how the "song bike path" will then look like. 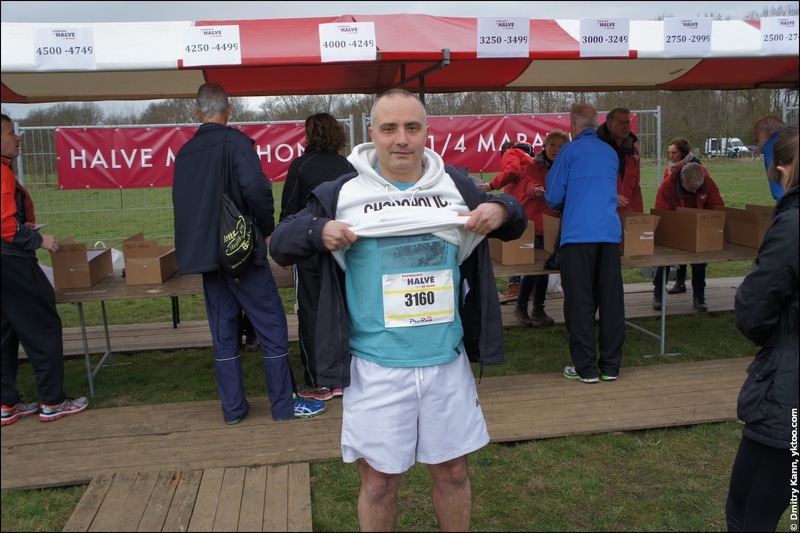 A long time ago in a galaxy far, far away in April 2010 I've run a five-kilometre track at the Enschede Marathon, held in the city of Enschede next to German border. As I was mostly running on a treadmill back then, it was quite challenging for me. Later I began to run outdoors, which is easier (not so boring) and harder (you have to control your pace and breathing) at the same time. And if the weather is not favourable, that's another complication. 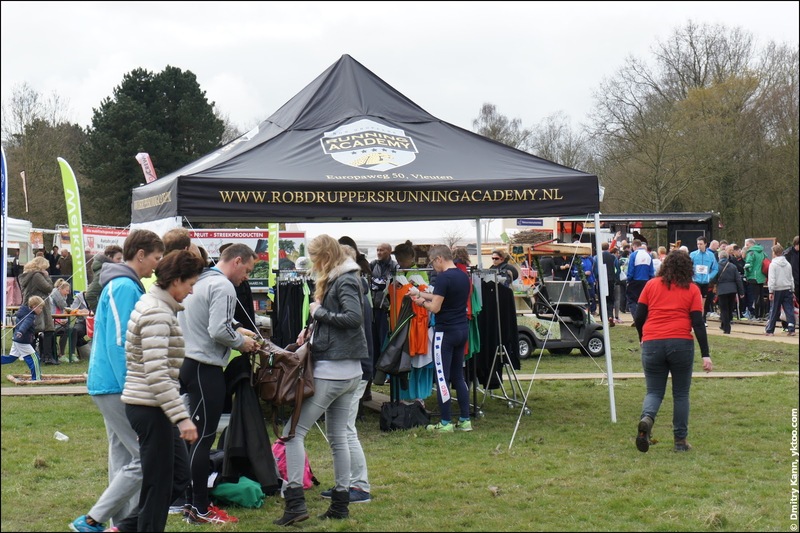 Then one day I've decided I felt confident enough as to start participating in running events, which happen here in the Netherlands almost on a weekly basis. So far I've taken part in two of such events. 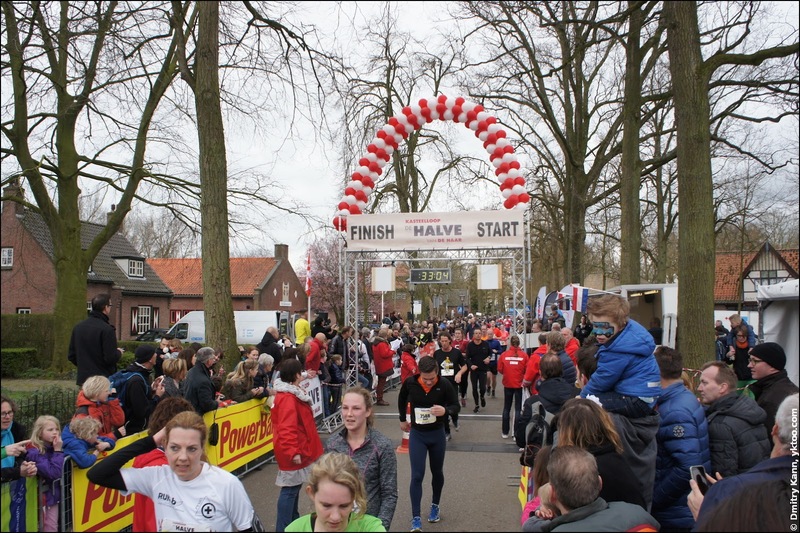 Since almost everyone is running in Holland, there's a high demand for new (half) marathons. 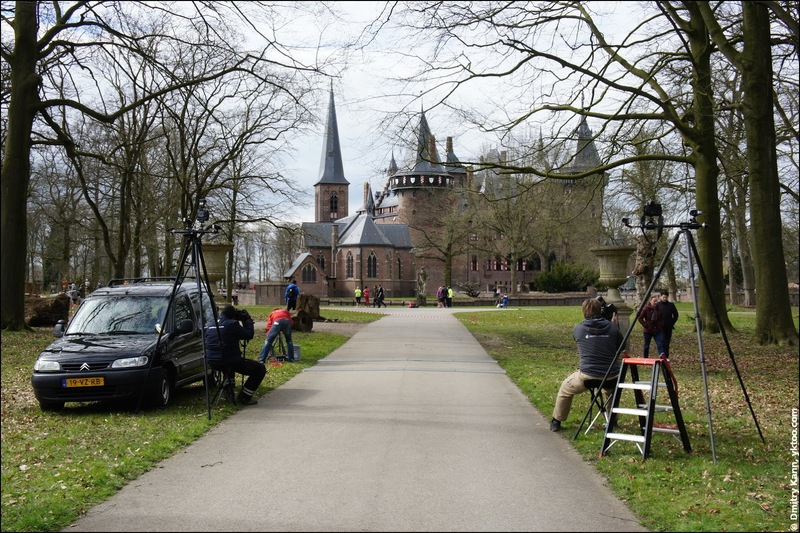 One of these new was De Halve van de Haar ("The Half of De Haar"). I took part in its very first occurrence on April 6, 2015. 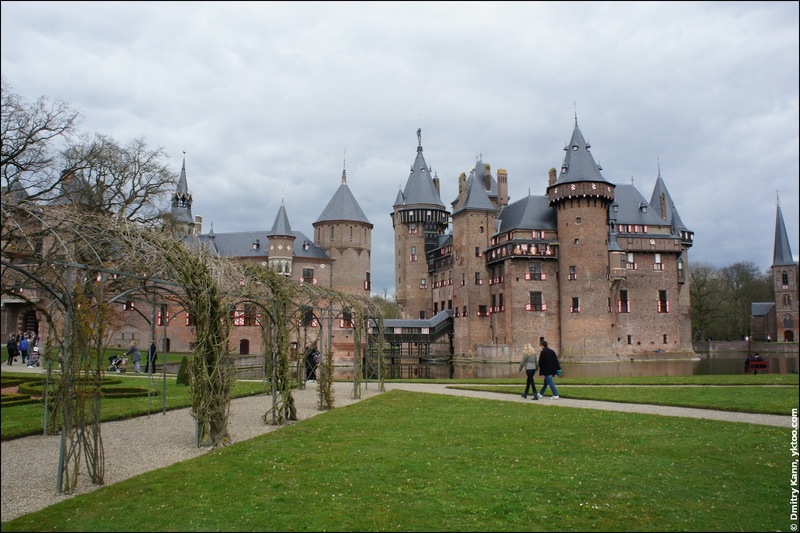 A special thing about it, as the name suggests, is that it's held in the park of the De Haar Castle, which I visited back in my first days in the country. 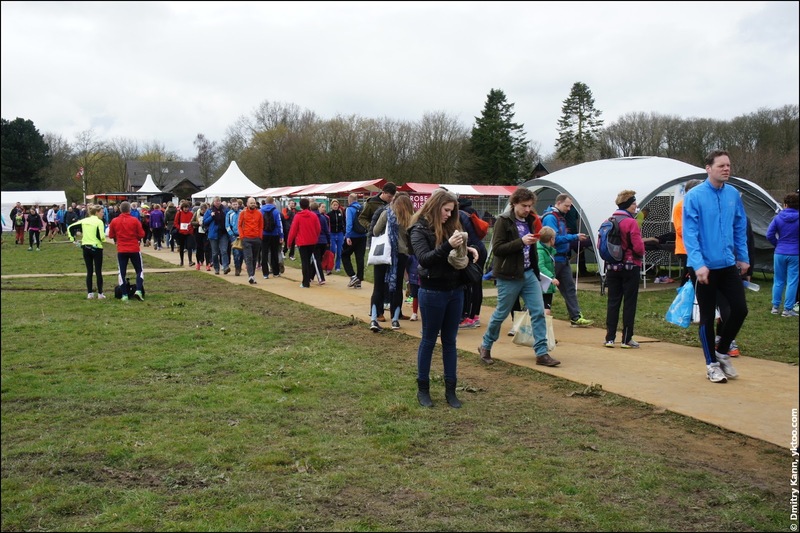 Every participant is given an individual number equipped with an RFID chip. This chip is read by special scanners at the start and finish. You can also write your personal data on the back side of the number, to be used in the case of emergency. 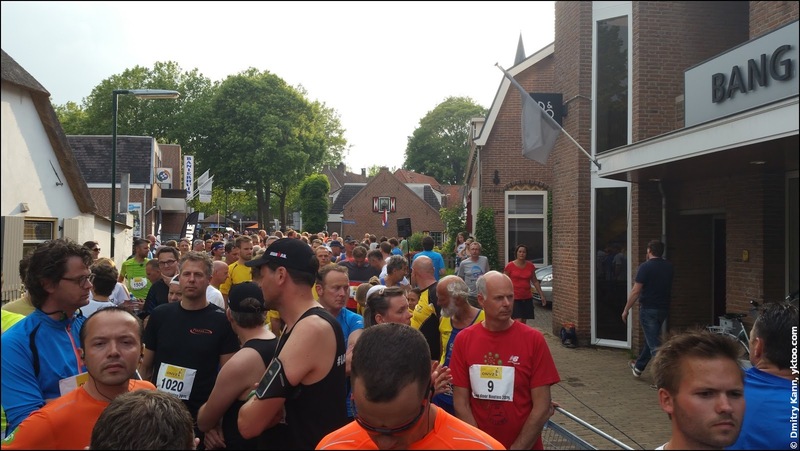 The yellow stripes denote the quarter marathon distance of 10.5 km. 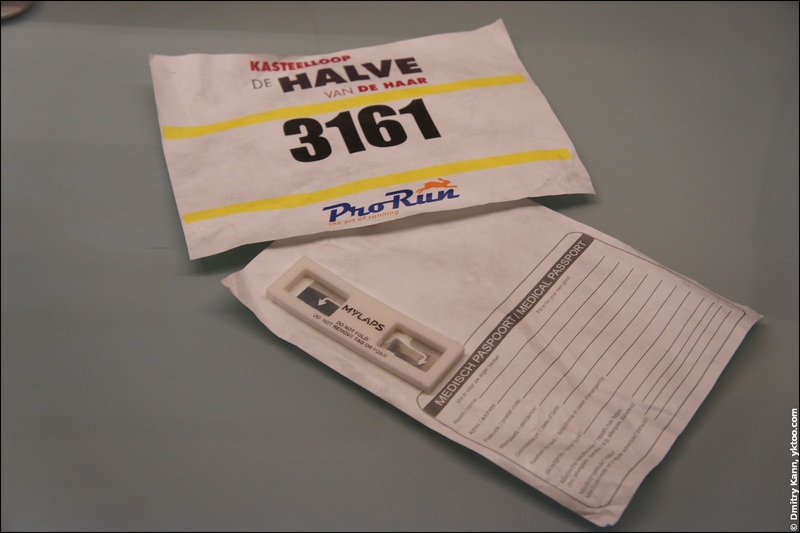 Bib number with an RFID chip. If we registered up front, we'd also have our names printed on the numbers. The marathon has a low profile yet, so it wasn't that crowded. 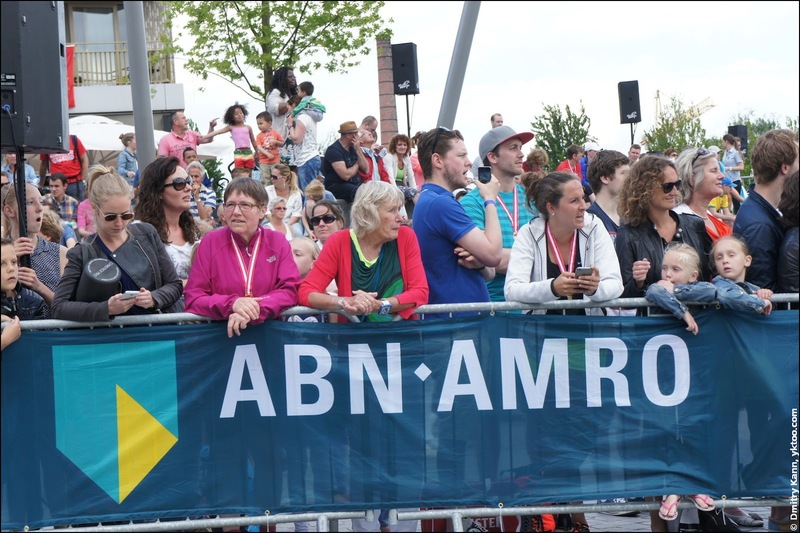 Better known ones, like Amsterdam and Rotterdam Marathon, attract tens of thousands of people. Which is a big challenge from the organisational perspective. The number is to be fixed on the clothes by its corners using four safety pins. How to wear the number right. 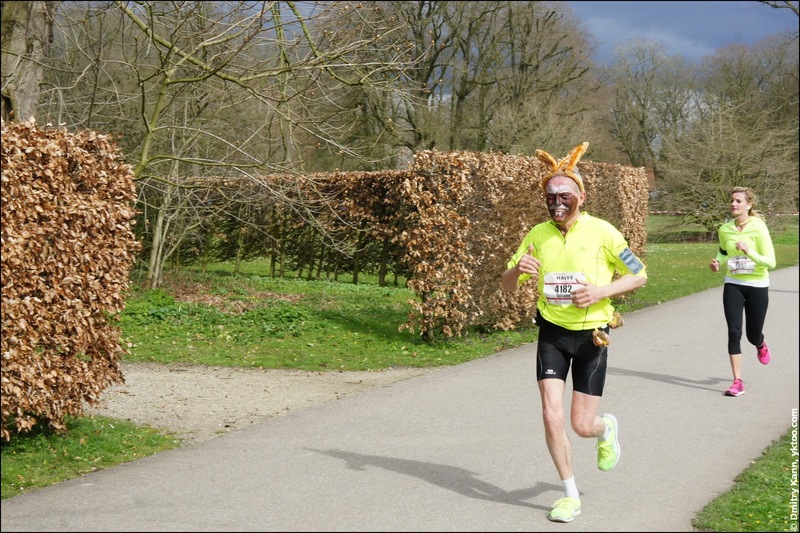 Those who wish to finish in a specific time can follow the so-called "hares" (hazen) or pacemakers, who run the entire distance at a constant pace. 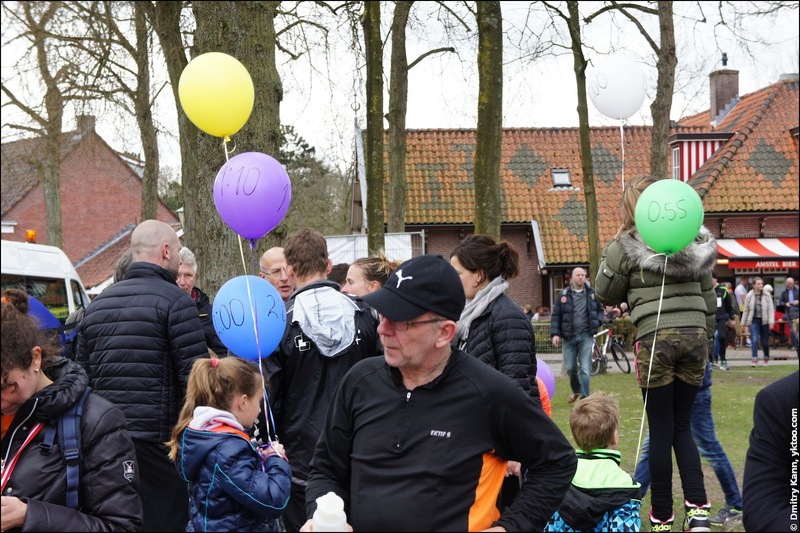 To be better visible, each of them is carrying a balloon, for instance, the green one finishes the quarter marathon in 55 minutes, the white one in an hour, the purple one in 1:10 etc. Once the run is complete, the balloons are given away to the kids. 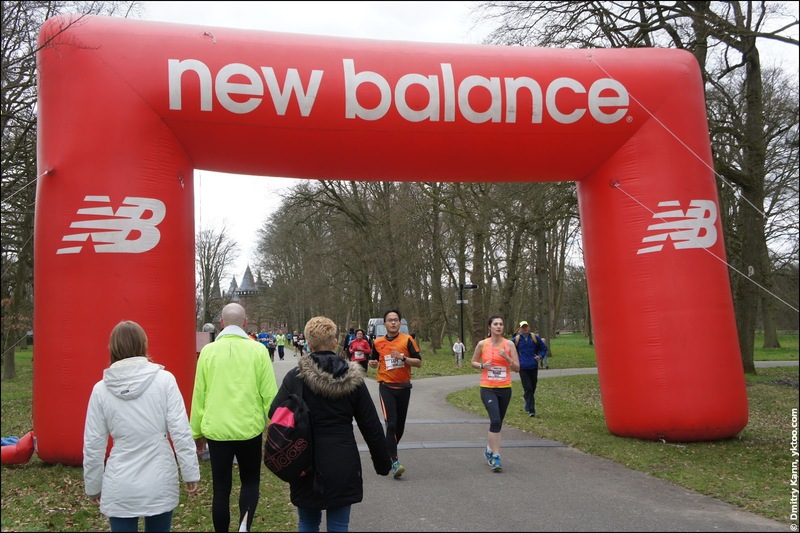 After we've finished our 10.5 km, we went for a walk to see those running the half marathon (20.1 km). The start and the finish. 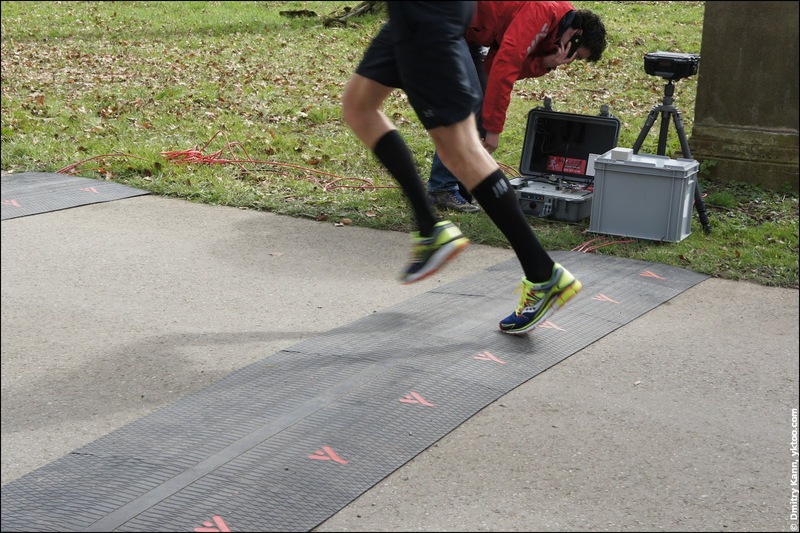 When you run through the gate, a special gun remotely reads the chip in your number. 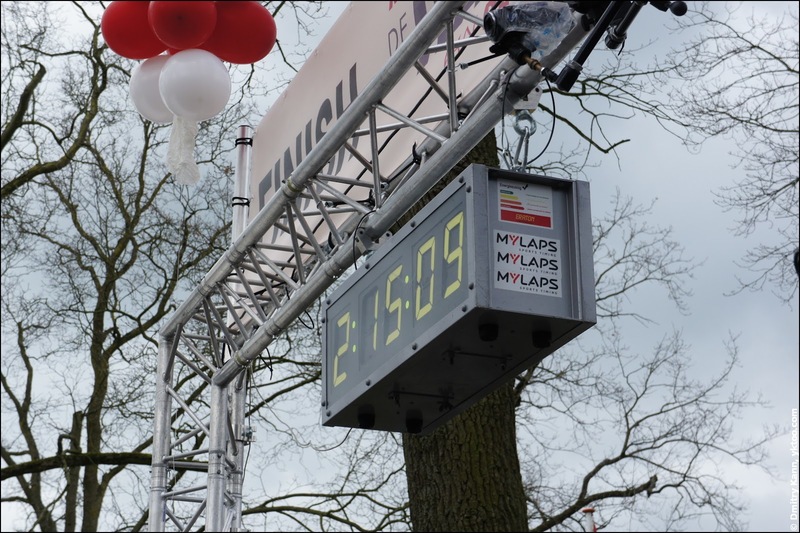 The clock below shows the total run time. As I mentioned above, the track goes around the picturesque castle park, and even crosses the castle yard a couple of times. 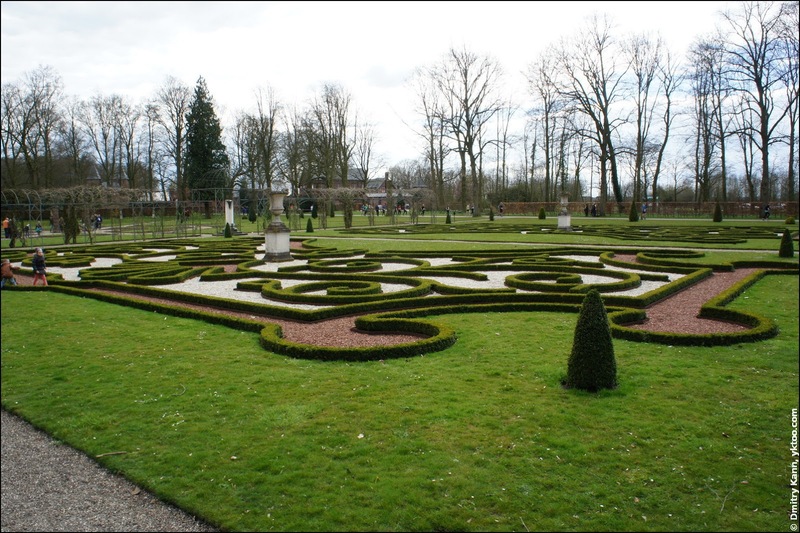 The park of De Haar Castle. The garden of the castle is a bit naked in this season, but still beautiful. 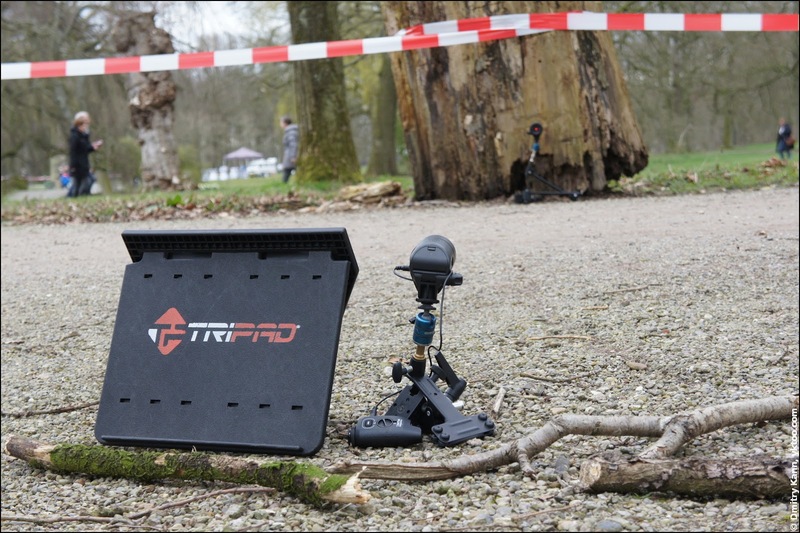 Besides the start and the finish, there are a few more intermediate registration points on the track. 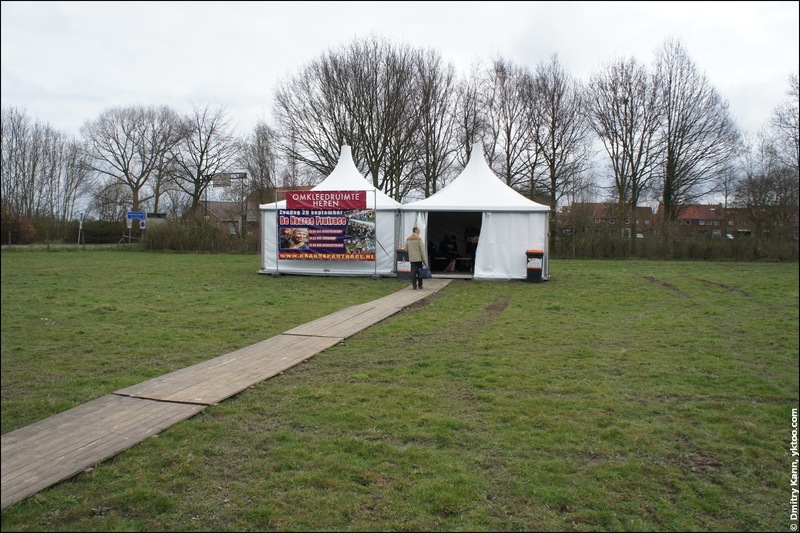 The timing is performed and published by a separate company, which is quite typical for Holland. 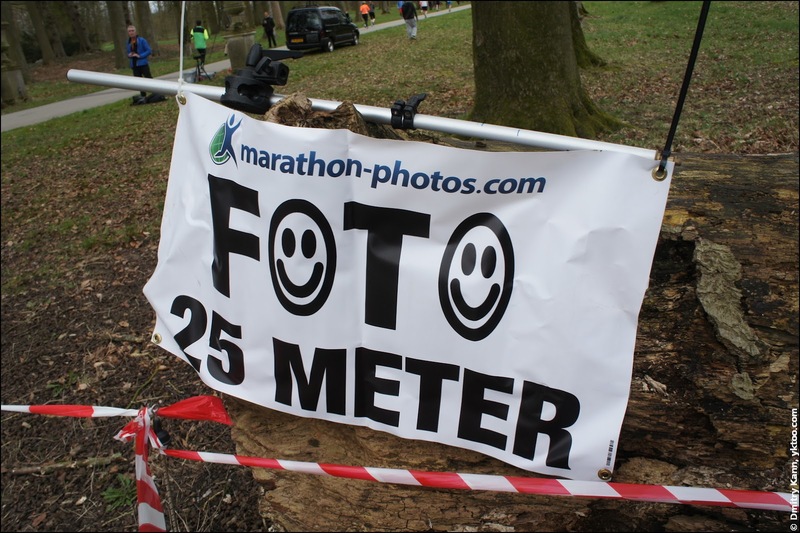 You're shot in 25 m.
The pictures can be found by your Bib number on the announced website. 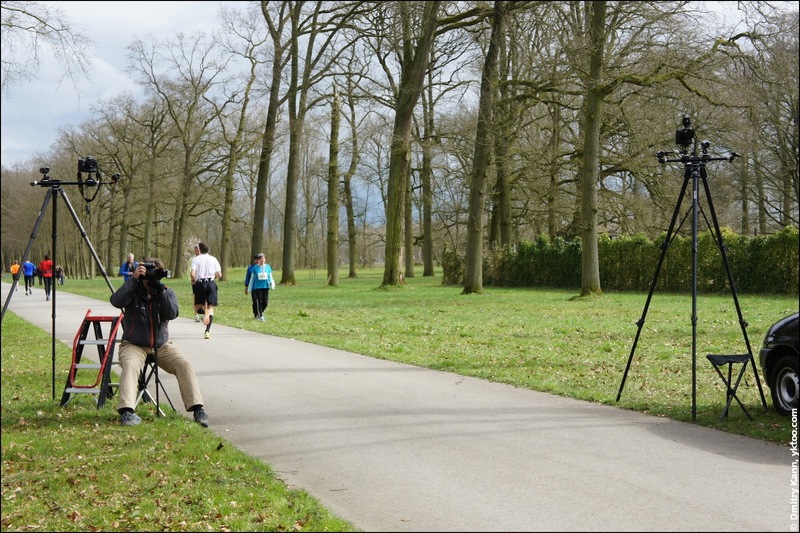 The price varies from €12.50 for a single photo to €45 for the whole package that includes video. There's a lot of cameras along the track, so you won't be able to cheat. 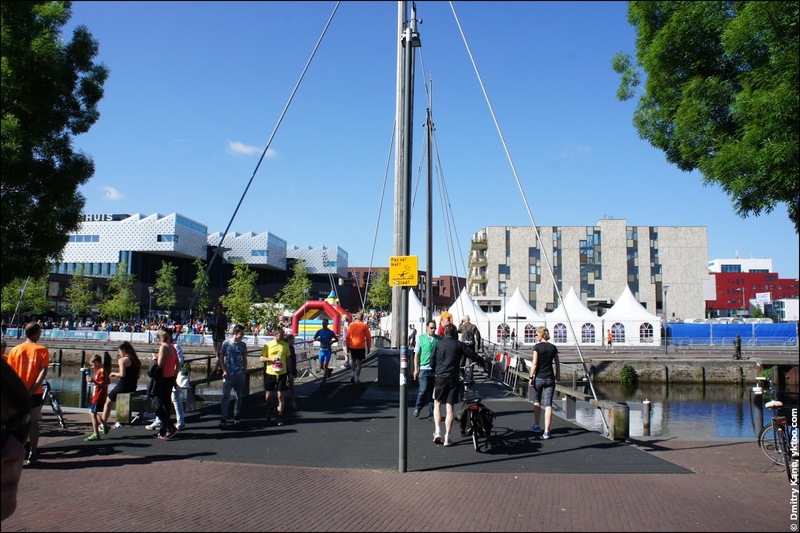 There is a big red gate that confusingly looks like a finish, but is some half kilometre before the finish line. 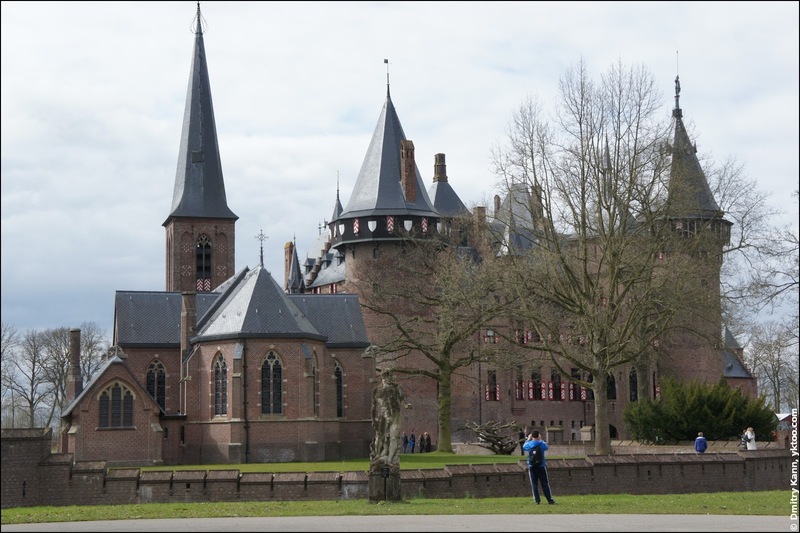 The lady in the pink shirt on the photo below is Sarah Watson, a granddaughter of Baron Van Zuylen van Nijevelt, a former owner of the De Haar Castle. 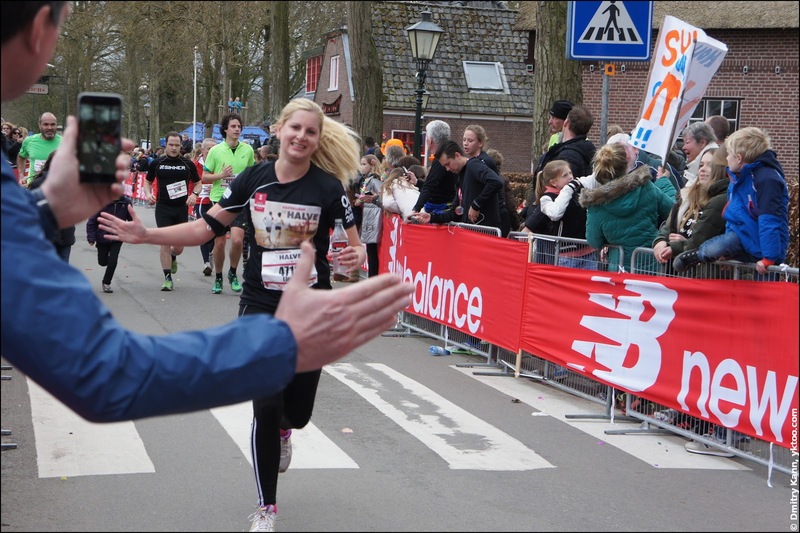 It was her idea to organise a marathon on the premises of the castle. Sarah Watson is on the right. My result (number 3160) was 53:26, which is a bit better than I expected. 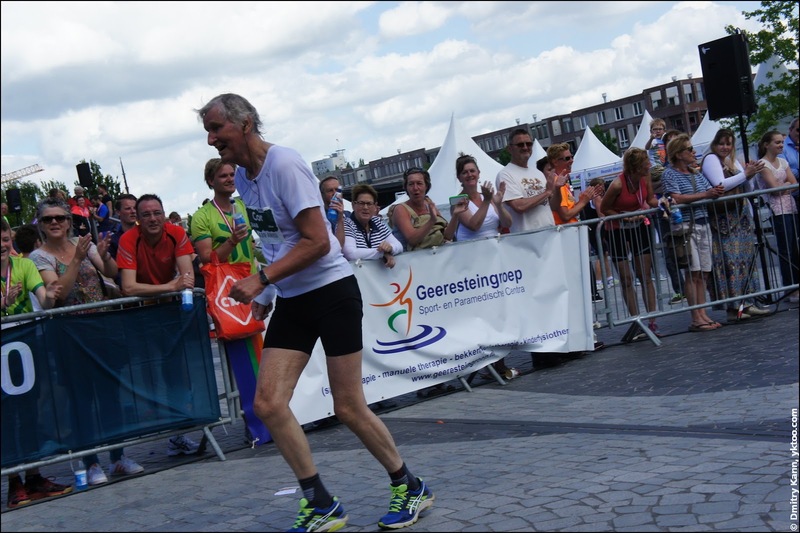 My target was to follow the pacemaker finishing in one hour, but I've eventually overtaken him and the one before him (finishing in 55 minutes). So my place was 289 (out of 1325) overall, and 234 (out of 662) among men. 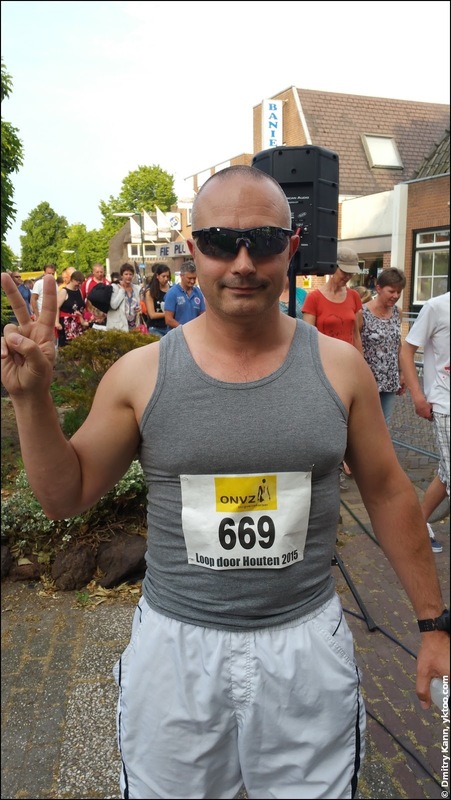 My second ten (and this time exactly 10 km) I've run in my home town of Houten on June 12, 2015. 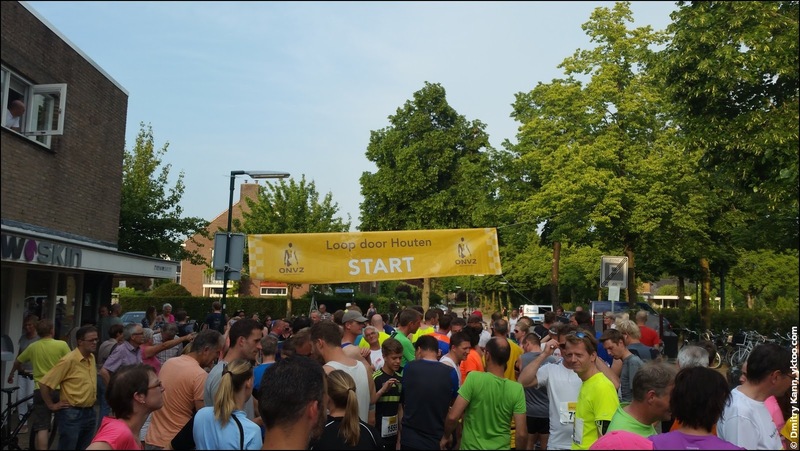 The event was called Loop door Houten (which simply means "Run through Houten"). 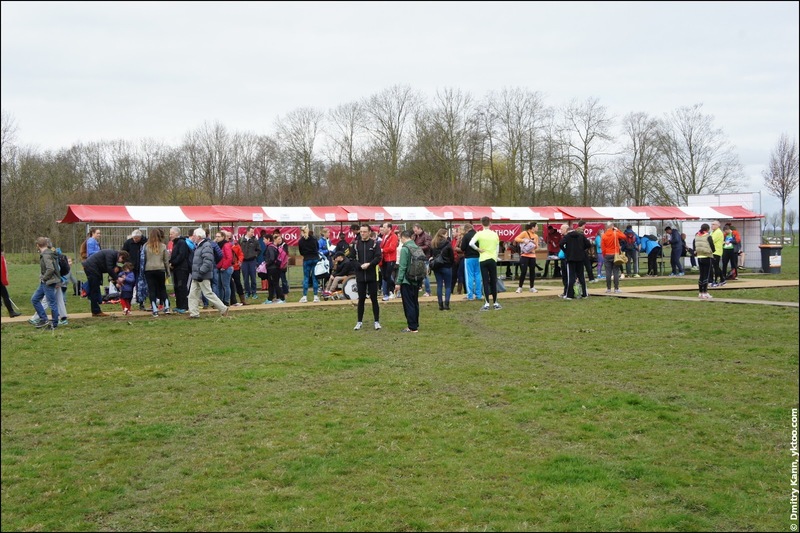 Thanks to its very small scale, the entry price was only 4 euros (as opposed to usual €10-20 for 10 km). Number 669 is ready to take off. It was a scorcher with the temperature of 27 °C (which feels like 35 °C in our humidity). Luckily, the run started as late as 8 PM, when the sun was already low. 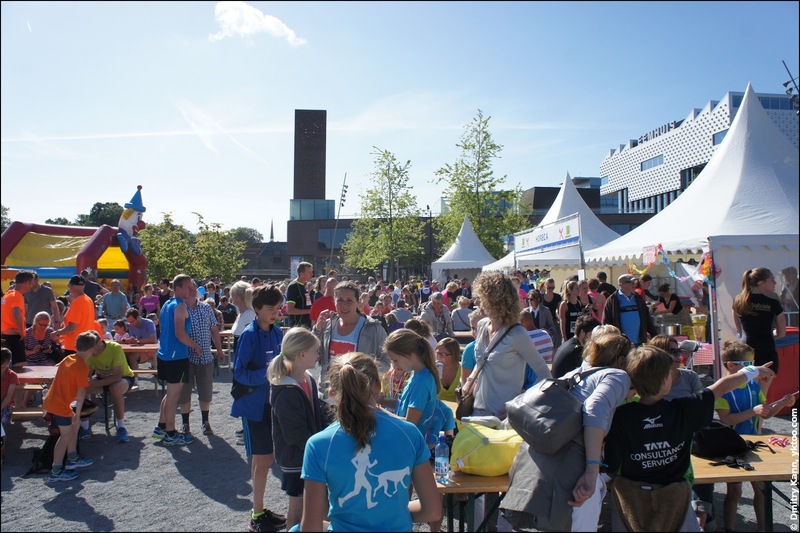 In total there were 511 kids and 871 adults (out of which 555 ran 5 km, 316 ran 10 km). 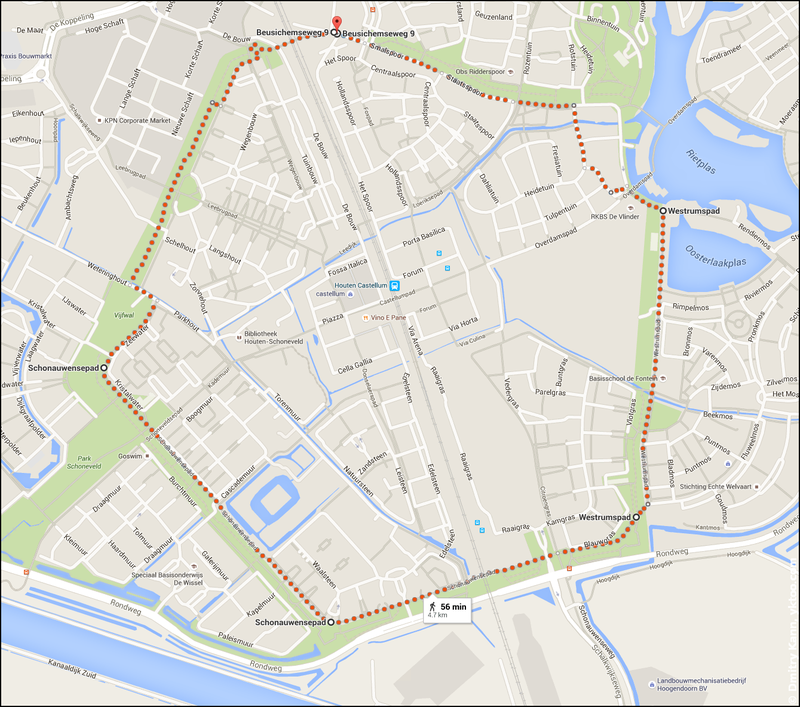 For Houten it is quite a bit. I liked the local atmosphere a lot. Loads of people stood along the road to cheer up the runners. Many took their garden hoses out to sprinkle those passing by, to help with the heat. Kids were offering us water. And in several places there were DJs playing music. Despite the heat, my result was quite good: 51:31 and the 119th place (out of 316). 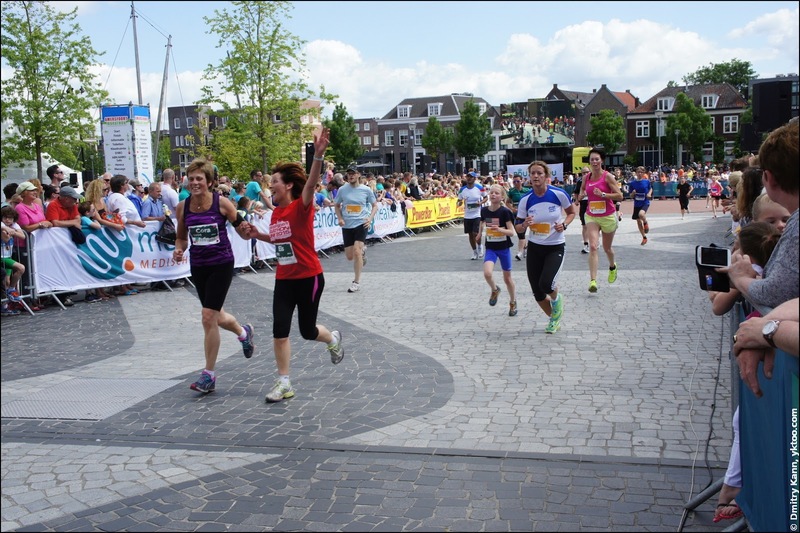 I've also participated in Marathon Amersfoort held on June 7, but only as a photographer. 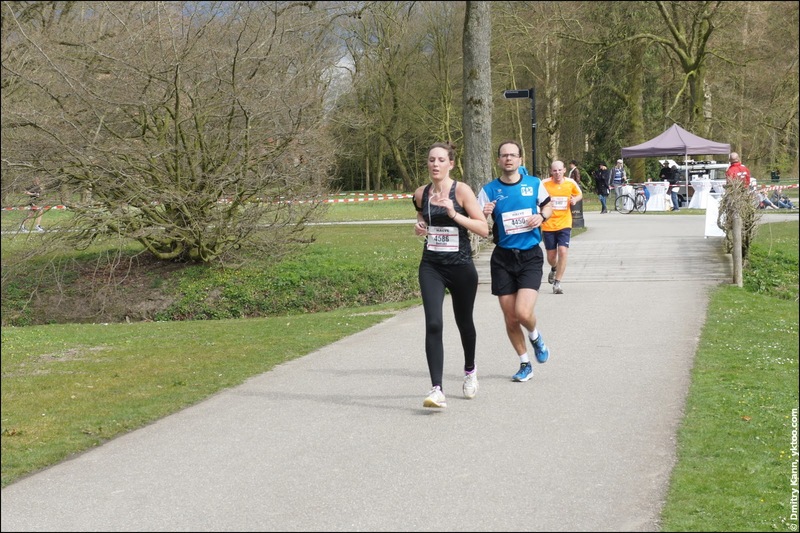 My girlfriend was running a half marathon (21.1 km). The weather was sunny and pretty warm. This event is clearly more popular than the other two. 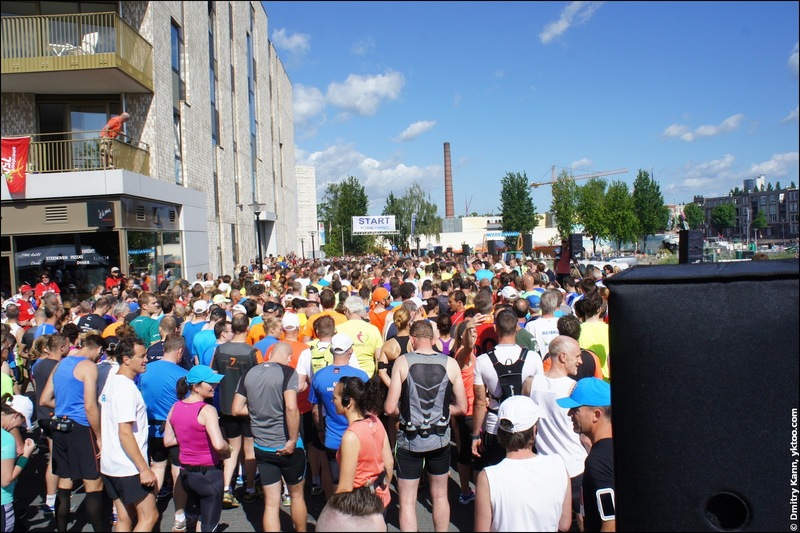 A huge crowd at the start: 1219 half marathon and 121 marathon runners. The start of the marathon and the half marathon. 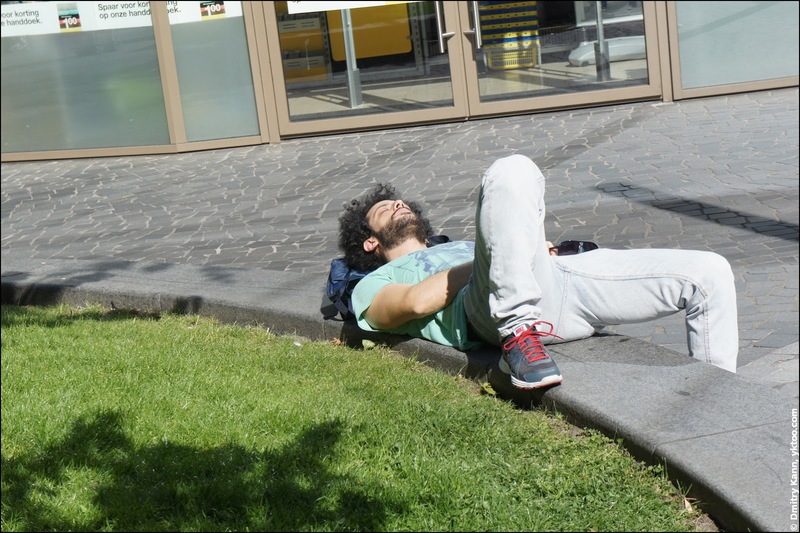 But not everyone felt like running on such a hot day. 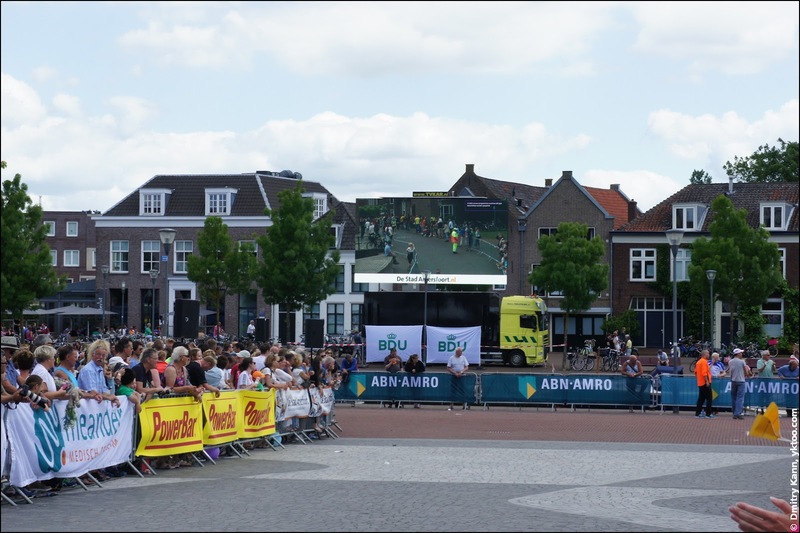 The finish of the marathon and the half marathon. It's amazing how many elderly people could run 21 in this heat. 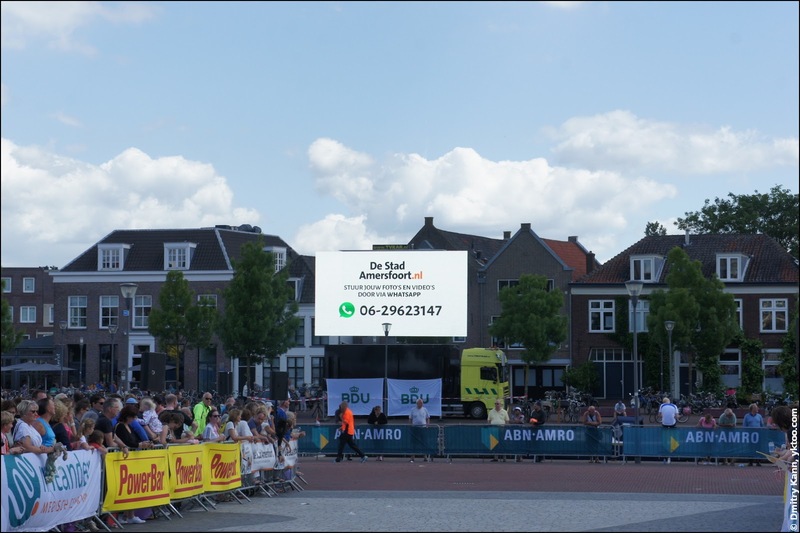 Right before the finish line there was a huge screen anyone could send their photos and videos to via WhatsApp. 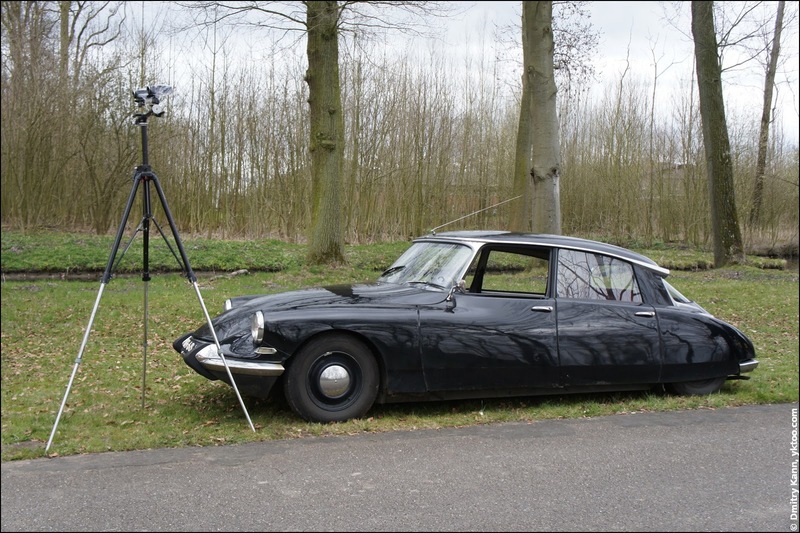 I've also recorded a few videos on that event. 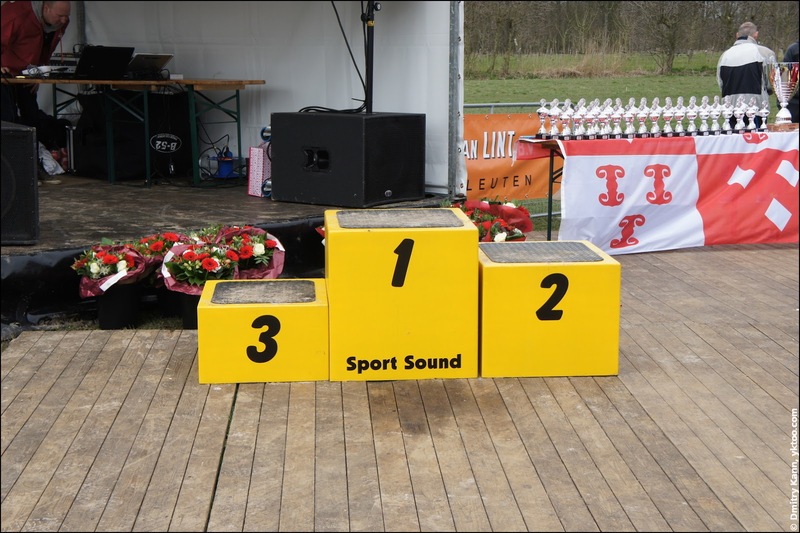 Every runner finishing the run gets a medal featuring the name of the event. We've already got a few. 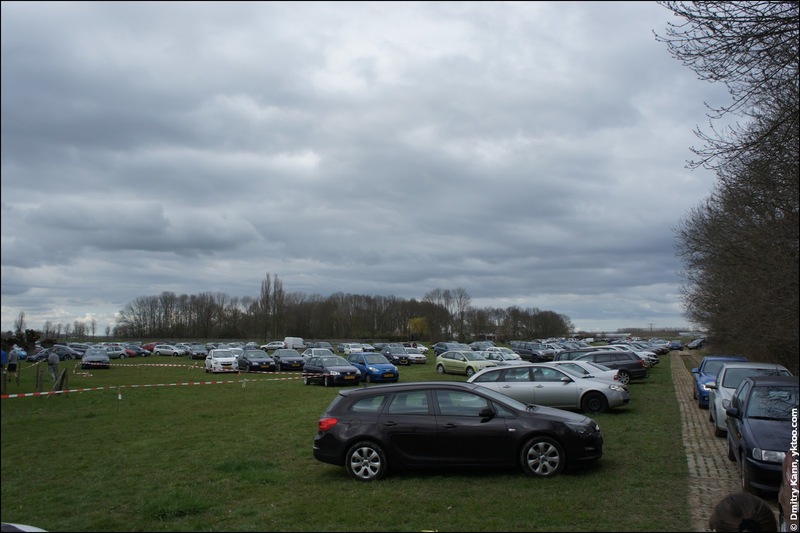 We have also registered for the next De Halve van de Haar, which is to be held on March 28, 2016. 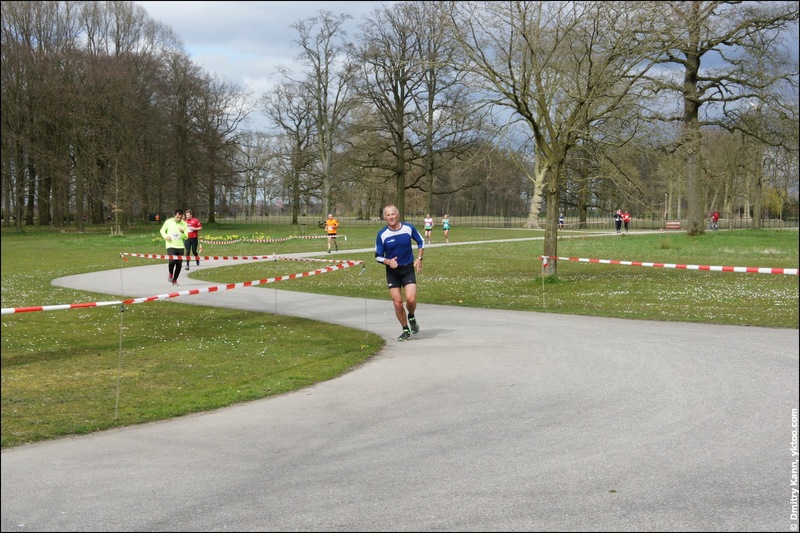 This time for the half marathon (21.1 km). This is going to become my first.